It looks like everyone is riding behind Facebook and trying to integrate as much of Facebook as they can into their applications. Yahoo just released their beta version of Yahoo Messenger 11.This version has tried to integrate features into itself like Facebook chat integration, games like Farm Villie, Mafia wars etc. Get your friends involved â€“ Share your game activities and play-status so that friends can join your game and you can join theirs. Keep up with friends wherever they are â€“ View, comment on and like updates from Yahoo! Pulse, Flickr, Facebook, Twitter, and more, all from one place, right within Yahoo! Messenger. Post one status to multiple social networks â€“ Share your Messenger status simultaneously on Yahoo! Pulse, Facebook, and Twitter. Chat with Facebook friends â€“ In addition to your friends on Windows Live, you can now IM your Facebook friends right within Yahoo! Messenger. As I said before, the two major feature addition /changes in this are integration of Facebook chat into Yahoo IM and making your History of conversations online. Putting chat/IM history online is quite a risky stuff as most of us use IM for personal chat and hence it raises few privacy concerns. I bet most of us would like to put our Chat/IM history offline only. Perhaps this is what happens, when Facebook comes into picture. Most of us do remember how Facebook keeps changing privacy settings on its own. 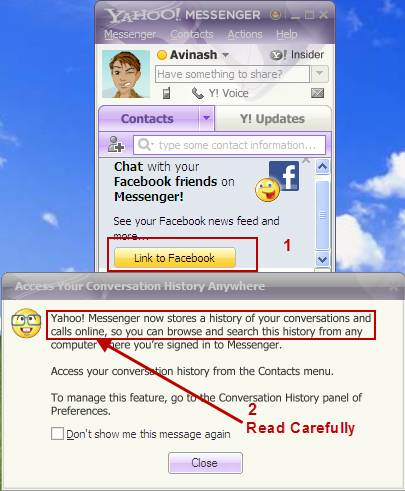 We would love to hear some feedback from everyone who use Yahoo messenger on these new features. history should always be kept offline. important stuff is to be said face 2 face, nevertheless what is mine i want it on my hard drive; not online, for others to hack. i don’t trust anybody to keep safe online data for me. this is just another step into the “track everybody” process. i hate yahoo for doing this. yes, you are right. Most of us prefer to have our data offline and looks like yahoo is doing the opposite while trying to do things like facebook. Whatever the level of security, it is prone to hack attack.